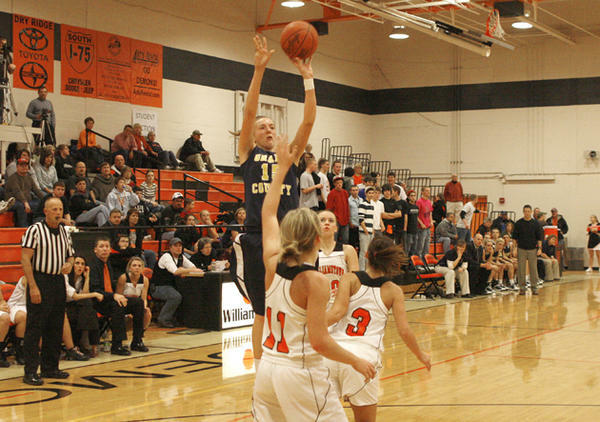 The girls’ county rival game between Williamstown and Grant County felt like March Madness, as Lady Demons senior point guard Chelsea West hit a three-pointer with 20 seconds remaining to lift Williamstown over Grant County 46-45, Dec. 17. Williamstown senior forward Tori Wilhoit goes up for the shot over Lady Braves defender Paige Elliot (35) and Seneca Sullivan (13) during the Dec. 17 game at Williamstown High School. 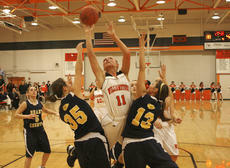 The Lady Demons won the game 46-45. Lady Braves sophomore Billie Hearn led all scorers in the game with 26 points. When West hit the shot the gym exploded and that’s how Lady Demons senior forward Tori Wilhoit likes it. As a whole, the Lady Demons (4-5) shot 18 percent from the field and were trailing for most of the game to Grant County (0-5). West said Lady Demons coach Mark Wilhoit set them up to get an open shot to go for the tie or for the lead. Wilhoit said he was fortunate that Williamston got the victory. That didn’t stop West from apologizing after the game for shooting the ball. Tori Wilhoit agreed with her father that West was going to make the shot. On the Grant County side, it was an upsetting loss for the Lady Braves, as they were seeking their first win of the season. For Lady Braves’ coach Darrell Guffey, even in a loss to their county rival Williamstown, he still was pleased with the performance of his players. Guffey felt that his team did everything they could to get the victory. 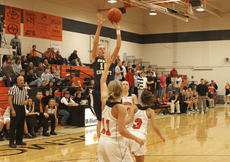 Sophomore forward Billie Hearn led the Lady Braves in scoring with 26 points. Hearn was pleased with her performance because of playing her favorite rival. Wilhoit knew Hearn was causing issues for his Lady Demons and made those adjustments in the second half. Grant County had an opportunity in the final seconds, but Tori Wilhoit grabbed a steal to seal the win for Williamstown. 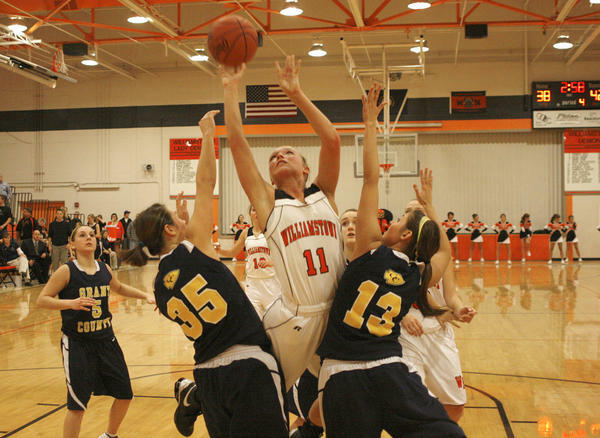 Both teams will be in tournaments after Christmas, with Williamstown playing in the Paris-Bourbon County Classic Dec. 28-30 and Grant County will be hosting the Grant County Invitational Dec. 27-30.